For a few months now, I have been participating in the What I'm Loving Wednesday because I thought it was a great idea to remember all the positive things that I love! However, I pretty much only loved school things. So today when I saw Playing with Pixie Dust's post with the same title as mine today, I thought that made much more sense! Also I have not blogged since Sunday because I kept forgetting my camera at school, so this might be on the long side. First, every morning we have a "morning meeting." I need to learn more about this, so I do the best I can. Over the weekend, I read on Mrs. Jump's blog about her Chit Chat activity that she does every morning to review from the day before. I thought I would give it a shot. My students are seriously obsessed and they think this is a game, which is fine with me. It gives us a chance to review from the day before and to preview new ideas. It helps a little with spelling also! Here is our Chit Chat for today. In science, we are still working on matter. Today we learned about gases, so after we had filled out the appropriate section of Mrs. Bainbridge's matter flippy book, I pulled the giant vocab visit papers out and we relabeled the pictures as solid, liquid, or gas using our new vocabulary! My last set of pictures shows the New Year's activity we did last week! I used the templates I found on Mrs. Lemons' blog. I read Squirrel's New Year's Resolution, which was cute. 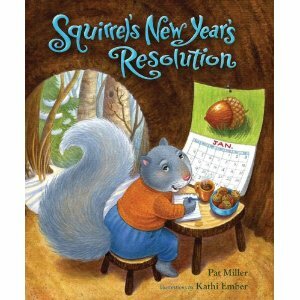 As we went through the book, I wrote down all of the animal's resolutions on the easel. When they went to write their own resolutions later, almost half of the kids chose one of the character's resolutions, which was frustrating. In the future, I'll have the kids add more ideas of their OWN resolutions that actually apply to their lives!! The craft still turned out cute though. What are you teaching this Wednesday?? I love that science activity! And the comments are so cute!! You just have the picture on the paper and have them write what they see? Also, I had a couple kiddos tell me about their new year "reservations"...that was pretty funny! I first wrote about it in my Science Vocab Visit post. We printed out about 20 pictures last week and set out the papers on our "intro the unit" day. They pretty much wrote whatever came to mind and I encouraged them to ask questions about the pictures if they were wondering anything, and if someone knew the answer, they could write that too! Many of my first graders are not writers and the first semester was a real struggle to get them to write enough words to make a sentence, but they loved this activity and wrote so much! And today we added to the pictures with "solid", "liquid", and "gas" labels as well as anything else that they wanted to add. I think I'm going to do this to introduce lots more long-term units in the future!! What a great activity! I love it! Also love your New Years activity, we did a similar one!